Do you feel that the ability to hear God's voice is for other people and not for you? Is it only for people who lived in Biblical times? Not at all! The God who loved you enough to die for you loves you enough to talk to you. And wherever you are in your spiritual walk, God will find a way to speak to you in a way you will understand. Become acquainted with the Voice that has spoken from a fire and a cloud, with visible signs and an invisible Spirit, through a burning bush and burning hearts. Hear from some of the most well known Christians in history about how God speaks to them, and discover for yourself how you can discern the voice of God. 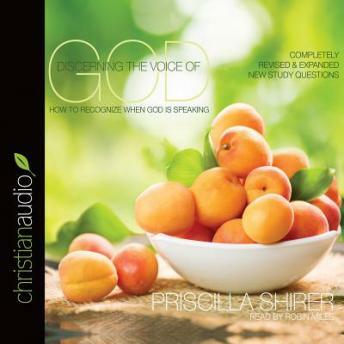 One of Priscilla’s bestselling titles, Discerning the Voice of God is now completely revised with updated content and reflection questions. Each section contains insights that will aid you in your desire to hear Him speak. Discover the treasure of recognizing how God keeps in touch with his beloved people.